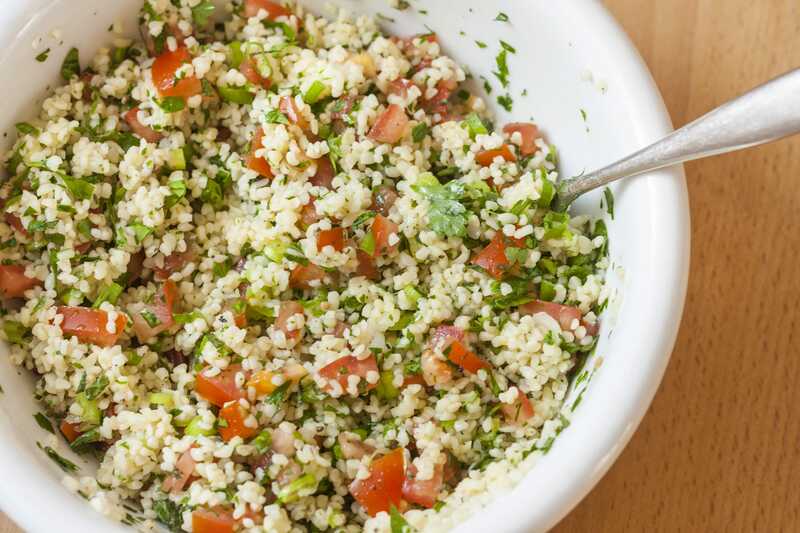 Tabbouleh (or tabouli) is a Middle Eastern vegetarian side dish made with tomatoes, cucumber, herbs, bulgur wheat, and onion. It’s seasoned with olive oil and lemon juice. This is a very refreshing, summery dish that goes well with just about anything. Since I don’t eat wheat, I usually make this with quinoa (much to my husband’s annoyance, since he doesn’t care for quinoa). It’s traditionally made with bulgur wheat, but quinoa works well with it as a gluten free option. With fresh herbs from the garden, this is a perfect time of the year to make this delicious and refreshing side dish. A refreshing and light side dish with fresh vegetables and herbs mixed in bulgur wheat and blended with olive oil and fresh lemon juice. In a large bowl or pot, place the bulgur wheat, lemon juice, olive oil and 1 1/2 tsp salt. Pour in boiling water and let stand for 1 hour.